The efficiency of DSSC has continued to increase in the last 20 years, with a confirmed record of 14.1% which was achieved by G24 Power advisory board member Professor Michael Graetzel and his team at Ã‰cole Polytechnique FÃ©dÃ©rale de Lausanne (EPFL). These research-cells are produced in the laboratory with the knowledge and advances in DSSC efficiencies due to be transferred into production cells at G24 Power in the near future. 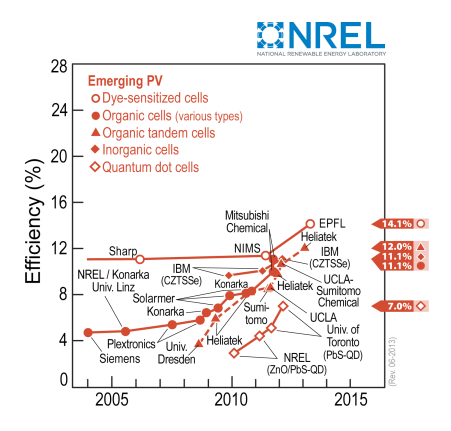 The chart on the right is adapted from the National Renewable Energy Laboratory Research Cell Efficiency Records chart. The efficiency of DSSC and other solar cells for outdoor applications, such as building integrated photovoltaics (BIPV), is typically measured under standard test conditions (STC); Temperature 25Â°C, Irradiance 1000 W/mÂ² (1sun), Air mass 1.5 (AM1.5) spectrum. Under these test conditions a solar cell with 1mÂ² surface area producing 100 watts of power is measured at 10% power conversion efficiency (PCE). However, the calculation of DSSC efficiency for indoor applications differs. The air mass (AM1.5) is not relevant for indoor PV operating conditions. For example, if we used a realistic indoor light level and surface area for an indoor application – Irradiance 100mW/cm2, with a 1cmÂ² surface area producing 10mW then the PCE is measured at 10%. Using power density can be a more tangible performance measurement of GCell when used indoors. The method uses power output (e.g. microwatts) for a given area (e.g. per cmÂ²) at a luminance level (e.g. 200lux). The potential for improvement in the power conversion efficiency of DSSC is one of the reasons it is regarded as a highly promising method for efficient and economical conversion of light in to electrical energy. DSSC improvements are buoyed by the development programs within large chemical companies that enable new combinations of materials, chemical formulation and cell structures to be considered. Areas for potential improvements include dyes, electrolytes, redox couples, photoanodes and tandem cell configurations. The theoretical photoelectric conversion efficiency (PCE) limit of the DSSC, using a simple junction configuration, under standard test conditions (STC) is 32%Â according to Professor Michael Graetzel. A two level tandem DSSC embodiment could reach 46% efficiency under the same conditions. HigherÂ PCE’s reaching close to 40% can be achieved indoors or in diffuse daylight that has a low infrared light content. To learn more about indoor energy harvesting capabilities visitÂ GCell.